15L. Secchi on bottom. Unk 35000. Incoming neap tide. MCloudy 10-15 SE barometer 766.8. 15L. Secchi on bottom. Neap incoming tide. Tiny cyanos cryptos and chloros P. 140000 unk (1 raphid and 1 karlo?). 70000 unk dino. Pcloudy 10-15 N barometer 765.4. 15L. Secchi on bottom. 1 slide then scan on scan noted unk dino gymno spp hetero spp cratium furca lepto proro spp. Sunny 10-15 SE incoming tide barometer 770.6. 15L. 1 slide then scan. C&C P. Mcloudy 0-5 E barometer 763.2 incoming tide. 15L. Secchi on bottom. C&C P. Unk 35000 (raphid?). Sunny 10-15 SE incoming tide barometer 771.1. 15L. Secchi on bottom. Sunny 5-10 N incoming tide 768.8 barometer. 15L. Secchi on bottom. Cryptos and chloros P. 70000 unk (dino?). Incoming tide neap Pcloudy 0-5 N barometer 769.1. 15L. Secchi on bottom. One slide then scan. On scan noted unk (akaishiwo?) nitzschia gonya spinifera asterionellopsis peridinium hetero spp. Cryptos and chloros P. 35000 unk (KB?). Pcloudy 5-10 S outgoing tide barometer 762.7. 15L. Secchi on bottom. Tiny cyanos P cryptos and chloros P. 105000 ciliate 35000 unk. Cloudy 5-10 N incoming tide barometer 766.4. 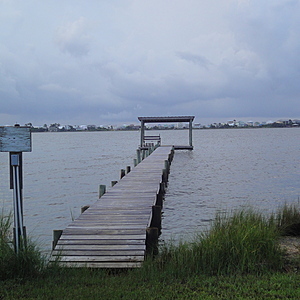 Site 2 pier is the Hatfield waterfront on Little Lagoon. We are NE of Lagoon pass and this Site tends to be saltier than Site 1, with occasionally high but overall lower bacteria counts than Site 1, with occasionally very high freshwater/groundwater/nutrient inputs, and with very dense Spring and Fall Diatom blooms.